Can the modern photographer profit from these ideas? Rob Hudson describes himself as a ’conceptual landscape photographer’ and lives and works in Cardiff, Wales. His work, which is always in series, explores how we relate to the landscape. 15th October to 12th November, The Photo Parlour Nottingham. Private view 14th October 18.00-20.30. Featuring work by Valda Bailey, John Blakemore, Jacqui Booth, Alex Boyd, Al Brydon, Mike Colechin, Chris Friel, Rob Hudson, Stephen Segasby, Dan Wood and Joseph Wright. More information can be found here. Inside the Outside is a collective comprising: Al Brydon, Stephen Segasby, Joseph Wright and myself - Rob Hudson. We were brought together by a similar approach to photographing the landscape. Our name comes from the great Scottish naturalist and founder of the American national parks movement John Muir, who said, "I found that going out was really going in." We are diverse in technique, style, method and process; yet we share a similar approach and understanding that is difficult to summarise in a succinct phrase, but might be shortened to ‘beyond the visual’. This isn't without irony, as it's also the title of a conference where three of our founder members first met. Somewhere in our DNA, there is a shared appreciation of the need for varying degrees of narrative, metaphor and investigation. That a photograph should speak of something more than the photographic process itself. That there's a big difference between a photograph of something and a photograph about something. We are diverse in technique, style, method and process; yet we share a similar approach and understanding that is difficult to summarise in a succinct phrase, but might be shortened to ‘beyond the visual’. Whereas the common understanding of landscape photography is broad, its intentions to catch as many as possible, our aims are more liberating, and possibly more uncompromising. We're more focused on the intimate relationship between the voice of the photographer and the inner eye of the viewer. The exhibition aims to bring our work together with others who share this perspective, to act as a marker of where the photographers of the landscape are at now, and to introduce these ideas to a broader public. The selection in many ways marks the closing of a circle, the expression of a voice that for too long has remained quiet, restrained by its own intimacy and engaged with looking out in order to look in. I fell in love with the landscape of South Wales long before I fell in love with photography. It was the experience of that landscape; it was its valleys, hills and coast that could alter my perceptions and emotions, that opened my mind to a new world of possibilities. It would be in photographs of that landscape that my thoughts and feelings were first given a tangible expression. Photographing the landscape introduced me to new friends, which led to us forming our collective and now to an exhibition. Although the exhibition is of landscapes of England, Scotland and Wales, that isn't all they are about. The images maybe of the diverse territories of our islands, they may describe the topography for us, yet they also use the voices found in their subjects to speak about other things. Mainly they use them to talk about us, the people who view, make and inhabit these lands. Landscapes without those people are just nature. Landscapes don't exist without being imagined through the prism of our intellect (or indeed cameras). 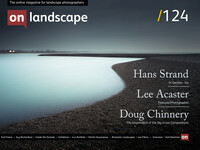 Landscape is an idea; we bring landscape into being. So it should be no surprise that the photographs also speak of the way we interact, see, feel and think about these environments. The intention of these photographs is often to render the abstract worlds of thoughts and feelings more concrete through the depiction of the physical world around us. They inquire below the apparent surface and build, in series, to a bigger picture. As it is we who make the landscape it is ready to be mined to illustrate ourselves. Being in the landscape (and representing the landscape) is to simultaneously inhabit two worlds, the one before us and the one inside us. And when those two worlds collide and intermingle the result can often surprise. Dealing as it does with the apparent reality of what is before us, and also with the often unspoken ability to express something of our inner selves; photography, it turns out, is the perfect medium to explore our relationship with the land. And it is also the perfect medium to mediate between those two simultaneous worlds of being there experiencing and the revelations that occur when we open ourselves to the creative possibilities of that liminal space. To my mind there are two elements that make a successful landscape photograph; they portray both that which we already knew and help us see that which we thought we knew. In Seamus Heaney’s essay ‘The Sense of Place' he describes two (often contradictory) ways in which we experience the landscape: "One is lived, illiterate and unconscious, the other learned, literate and conscious." Yet, he goes on to say, "both are likely to coexist in a conscious and unconscious tension." The individual photographers will be your guides to the exhibition, and I believe they will both revitalise and illuminate our experience of place and through them ourselves. I hope our visitors can take the time to look through each photographer's work, in turn, to find the value in each and the connections between. Valda Bailey’s ‘Southern Song' is part of a larger project that attempts to explore the Japanese concept of Wabi Sabi. One of many dictionary definitions defines it as "a way of living that focuses on finding beauty within the imperfections of life and accepting peacefully the natural cycle of growth and decay. Valda focuses on the bittersweet beauty of the transience of nature and its imperfections that she finds expressed in her Sussex garden. John Blakemore is one of England’s leading landscape photographers and is Emeritus Professor of Photography at the University of Derby, where he taught from 1970 to 2001. Informing all his work is a constant interest in death and decay, the cycle of nature and the history of Western visual culture, as well as an all-consuming concern with the craft of fine photographic printing. Notably for an exhibition by Inside the Outside he is the author of ‘Inscape’ a book of biographical landscape photographs made between 1971 and 1991, which shows his ideas both influenced and predate our own. Alex Boyd’s series 'The Hebrides' began in 2013 when he was appointed as the Royal Scottish Academy Artist in Residence on the Isle of Skye. Despite using Victorian photographic processes, he wanted to push his practice in new directions, both physically, mentally, and aesthetically. While he worked on this series Takeshi Shikama, the renowned elderly Japanese photographer, printer and artist, accompanied him on many of his journeys. His influence on the work is apparent, with Japanese minimalistic approaches to image making paired with a dedication to craftsmanship. In ‘Yours and Mine’ Jacqui Booth finds the land is the only place that allows her to draw her own interpretation. The contours of the land, the ruined traces of humanity that pervade it and the foliage covering it are mute. Even the prevailing environmental factors have no voice other that what we’ve applied through folklore and literature. It’s up to us. We’re the ones making it speak, be it a howl, whisper or a lullaby. It’s there for the taking. Al Brydon discovered twenty rolls of undeveloped exposed film but was unable to recollect what they might hold. The films were originally exposed roughly fifteen years ago, and he couldn't have known this would be the basis for a conversation with his future self. As each new exposure was made, he realised he was in effect destroying the original, but creating a new link with someone long gone. The result of this conversation was ‘Based on a False Story’, a unique collaboration with his former self. Making double exposures 15 years apart to explore memory, time and the gulf between who we are and who we were. In the act of alarming optimism, he has kept one film back to re-expose in another fifteen years. Mike Colechin’s ‘Graphica Ricercata’ is inspired by the Hungarian avant-garde composer, György Ligeti and Mike’s collaboration with the pianist Stuart Ellam. Like the music, the pictures are part of a much larger body of work - an exploration of the landscape in and around a series of gravel pits at Attenborough to the West of Nottingham; an on-going work of photographic research in a liminal location, where urban sprawl is curtailed by the need to give a river room to breath. It is a space exploited by industry - first through extraction of aggregates and now by the business of managing nature for the benefit of wildlife, but also for the benefit of the local human population. Chris Friel’s ‘Memorial’ is another series to use music as an inspiration. In his series, multiple exposures of the flowers left on graves are digitally displaced using audio samples from Fauré's Requiem Opus 48. In his travels, he's been fortunate to film burial ceremonies around the world. Including celestial burials in Tibet and Mongolia, fire burials in Bali, ritual finger amputation in Papua New Guinea, and the ceremony of Famadihana in Madagascar where the dead are exhumed, rewrapped in fresh cloth and then danced around the grave before being reburied. So a walk in his local overgrown and generally ignored Victorian cemetery full of plastic flowers set him thinking about the British attitude to death and memorial. Stephen Segasby’s ‘A Process of Reclamation’ depicts the healing of scars in a post-industrial landscape that hint at the healing of our inner scars; and both nature’s and our own strength in adversity. His work addresses the effects of human influence on the landscape and nature’s drive to return it to a new natural state. This series is solely photographed within abandoned slate quarries of the English Lake District, one of the areas significantly affected by the industrial revolution. Where slate mining to provide roofs for houses followed the migration from rural to urbanisation. It depicts a landscape’s journey through time and the change abandonment and natural decay bring to bear. While also reminding us of the people of the area moving from rural to Victorian urban squalor under the roofs of that very slate. Joseph Wright’s ‘The Lost Forest’ delves deep into our landscape's history and our fading connections to the past. It's an ongoing project begun in 2014 to rediscover and reassert the ancient boundaries of Bradon Forest. Retracing and walking its entirety, along the way telling its story by making images in response to topography, social history and to place. Exploring what forms boundary and permanence in the land, it's an altogether modern perambulation of ancient lines steeped in myth and folklore. Using the records from 1228 AD, his journey starts in the edge lands, suburbs and industrial estates of Swindon, through sculpted parklands, into the pastoral landscape, across farmland, visiting ancient towns and villages, and finally to the heart of the old forest. This reminds us all that our understanding of the landscape is too often one dimensional, when, in reality, it is deep with historical reminders, multilayered and open to multiple readings. In my own ‘North Towards the Orison’, which although ostensibly retraces a journey by the poet John Clare, also addresses the issue of mental illness and the restorative power, and perhaps therapy to be found amongst nature. In 1841 the poet John Clare walked out from the asylum in which he was incarcerated at High Beach in Epping Forest to walk the 80 miles north to his home in Helpston, near Peterborough. He went in search of his first love Mary Joyce, who’d been dead for three years and who he believed to be his wife, despite being married to another woman. The walk took Clare four days. The old word ‘orison’, meaning prayer is pronounced ‘orizen’, much like horizon with a silent ‘h’. When John Clare conflated these two words in his writing, I found a powerful metaphor with which to make a body of work that represented Clare’s search for that orison and in doing so also explore both our and Clare’s relationship with the land. The images were made in a small wood on the outskirts of Cardiff. There are yet more broad hints of the deceptions of the mind in Dan Wood's ‘Hypnagogia', where he expresses the fears found in those moments between sleep and wakefulness. These are dark, brooding diverse images of the world about us, but combined they speak of powerful, disturbing forces in our psyches. They take us to a realm of imagining and remind us of our fragility. These photographers demonstrate both the diversity of relationships with and expressions of, the landscape. This isn't the formulaic common conception of landscape photography, but of photographers who reached as deeply within themselves as they have closely studied the land around them. And in those photographs of the land, they provide a vision allowing for exploration of the self as equally as an exploration of the topographies of our islands. It seems timely to present an exhibition of photographs of the landscape. There are multiple threats to the environment from fracking, opencast mining and the industrialisation of farming, to doubts about the future of conservation funding after the Brexit vote. Plastics pollute our oceans, rivers and soil; pesticides designed to protect crops threaten to undermine the ecosystem upon which we all depend on. Technological change seems to conspire to drive us further away from the contemplative, healing qualities of the natural world. The landscape has become a place of physical activities, somewhere to run, cycle or walk the dog. It is mostly seen from the window of a train or car. We are becoming remote from the charms of the flaneur, aimless, contemplative, coexistence. How often do we walk alone into a dark wood, feel the spider's web upon our face and the cool, moist air surround us and feel cocooned by the gently swaying green oasis? Indeed, climate change could become a threat to the very future of human civilisation. These factors speak of our growing inability to listen to the voices of the landscape and the effects of our actions upon the environment. What can a photography exhibition do about this? Practically and directly, very little. But the photographs can remind us of what is threatened, not just nature, but all of us that it contains and mirrors. Our relationship with the landscape isn't purely one of physical dependency, but it's also spiritual and emotional. Photographers can deepen our understanding and appreciation of the landscape while also deepening our understanding of ourselves. Perhaps they could form a memory bank of a shared experience, for it's difficult to appreciate the beauty of a place after it's gone. Better, perhaps we could be persuaded to adopt a more sustainable existence because we become aware that the threat isn't simply ‘out there’, but inside, to us personally. For what we could lose is also a piece of the puzzle that makes us, us. Let us not forget going out is really going in.